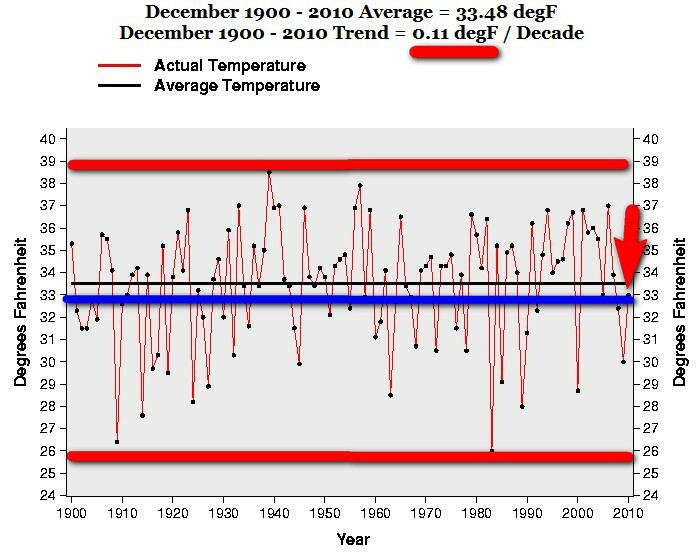 I have written extensively on this blog about the tweaking, “adjustment” and manipulation of the historic and present temperature “record” which are presented in the official figures. With the poor placement of stations (91 % of the stations are CRN 3 to 5 = bad to very poor); where they have purposely taken away the urban heat island effect, use huge smoothing radius, the historical “adjustment and tweaking” to cool the past etc. 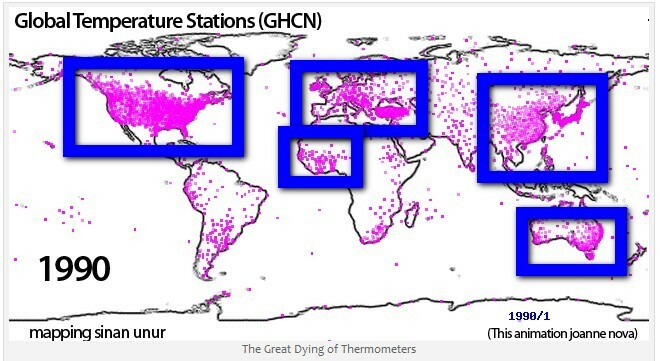 Not to mention the great slaughter of GHCN stations around 1990 – roughly 63 % of all climate measuring stations were “dropped”. Oddly enough many of them in cold places – Hmmm? 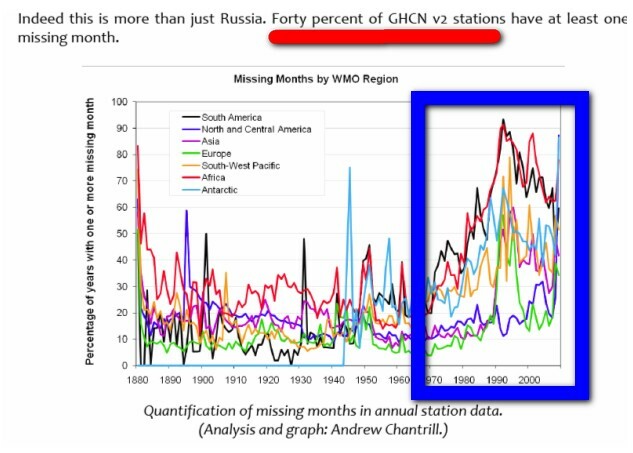 Now the number of GHCN stations are back at the same numbers as in 1890. The Big Difference Between GISS and UAH Temperature Data. On average 20% of the historical record was modified 16 times 2006 to beginning of 2008. The largest single jump was 0.27 C. This occurred between the Oct 13, 2006 and Jan 15, 2007 records when Aug 2006 changed from an anomaly of +0.43C to +0.70C, a change of nearly 68%. And what a “coincidence” that the data is always “modified” in only on direction – guess which one. And as I said in the beginning – always remember that these figures are based on the official data that has been tweaked, “adjusted” and manipulated to fit there agenda (cool the past, ignore UHI and land use change factors, huge smoothing radius – 1200km etc.).. Just a couple of weeks ago a new report was published by Patrick Frank that shows that there has NEVER been a measurement of Sensor measurement uncertainty in ALL the weather stations used for the “Global” temperature “record”. And that “the systematic error from uncontrolled variables has been invariably neglected”. Future noise uncertainty in monthly means would greatly diminish if the siting of surface stations is improved and the sensor noise variances become known, monitored, and empirically verified as stationary. So I thought I show you the drastic dropping of weather stations in 1989-1992. Others have shown this before and done a very good job presenting it. But it is worth repeating because most people has no idea on what shaky grounds the temperature records are based. And remember –This dropping of stations was done on purpose. And you can see on the graph what “happened” to the temperature after that. For some very “odd” reason it went up sharply. Can there be a connection??? And remember – Nearly ALL OF THESE STATIONS ARE STILL THERE AND GENERATING DATA. 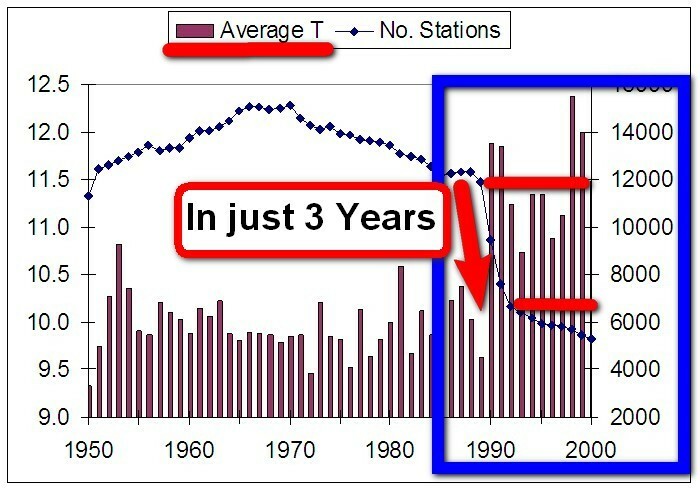 In 3 years, from 1989 to 1992, 5218 stations were purposely “dropped”. From 1993 to 2000 1384 more stations were “dropped”. A total of 6602 stations. And if we compare with 1970 with1992 8445 stations have been “dropped”. If we compare 1970 with year 2000 9829 stations have been “dropped”. This is the ”logic and science” behind the Global warming Hysteria. Where did all the stations in China, India, Asia, Africa, Latin America, Middle East, Russia, Antarctica, and Australia go????? Whole continents “just disappeared” and most of the landmass of Earth is now NOT COVERED. 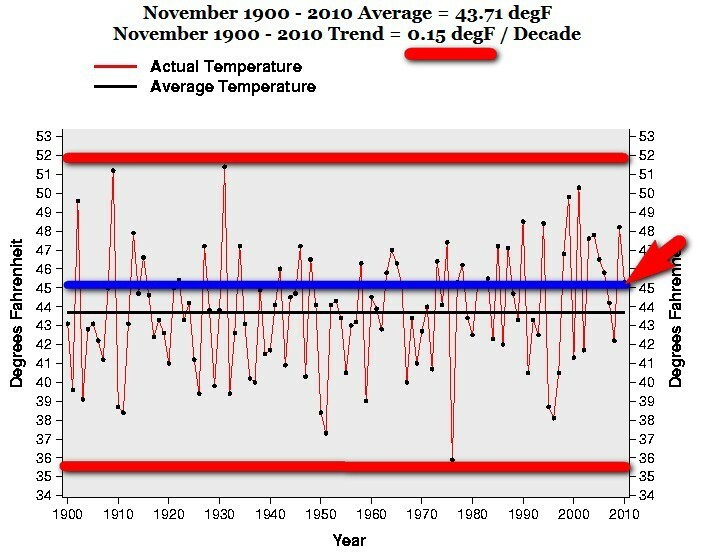 And how do you compare the “average” Global temperature when they dropped 9829 stations between 1970 and 2000?????? 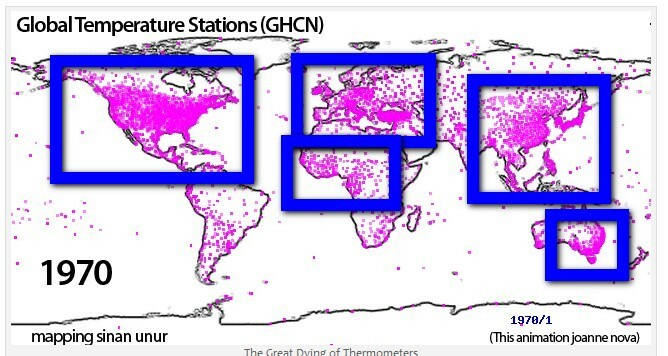 9829 stations that where part of the “average” global temperature???? This is the “science” behind the Global warming Hysteria. And it gets worse (which in itself s an “achievement”). Look at the map for 2010 – EVEN MORE landmass are “gone” on purpose. Including large parts of USA. See the huge contrast between 2000 an 2010 regarding USA. 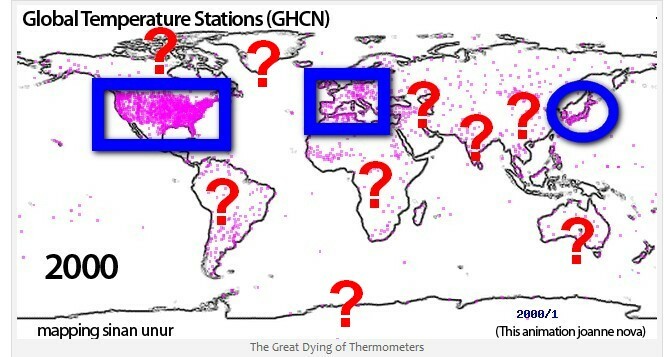 NASA ”systematically eliminated 75% of the world’s stations with a clear bias toward removing higher-latitude, high-altitude and rural locations. How “they” (NASA) make Bolivia a VERY HOT PLACE EVEN WHEN THERE IS NO TEMPERATURE STATIONS OR DATA FROM THERE. Another brilliant example of the trustworthiness of the Global Warming Hysteria. “One Small Problem. 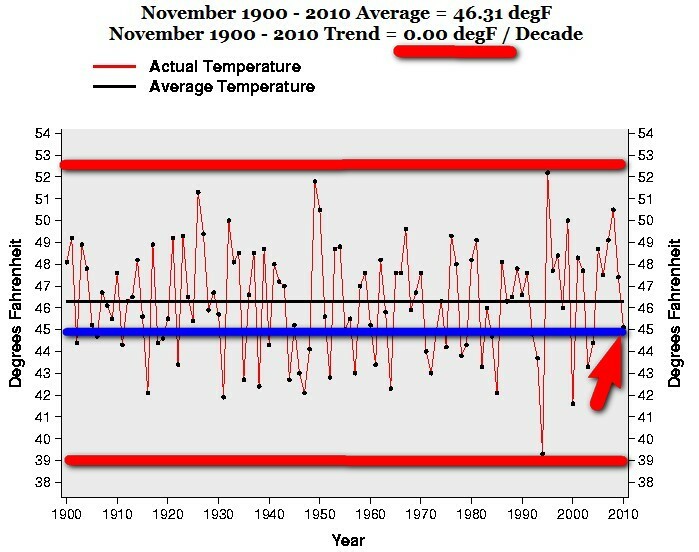 There has not been any thermometer data in GHCN since 1990. None. Nada. Zilch. Nothing. Empty Set. So just how can it be so Hot Hot Hot! in Bolivia if there is NO data? Easy. GIStemp “makes it up” from “nearby” thermometers up to 1200 km away. 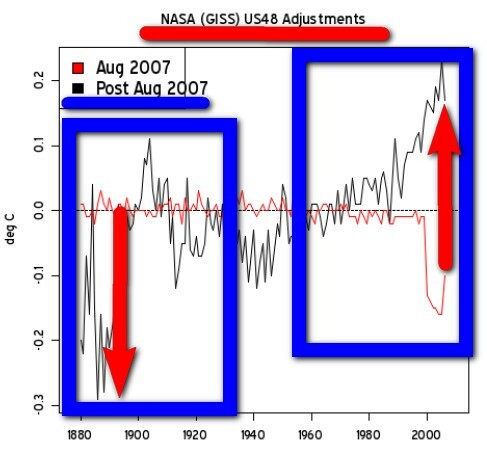 Just look at this “tweaking” done by NASA/NOAA in August 2007 to the temperature “record”. 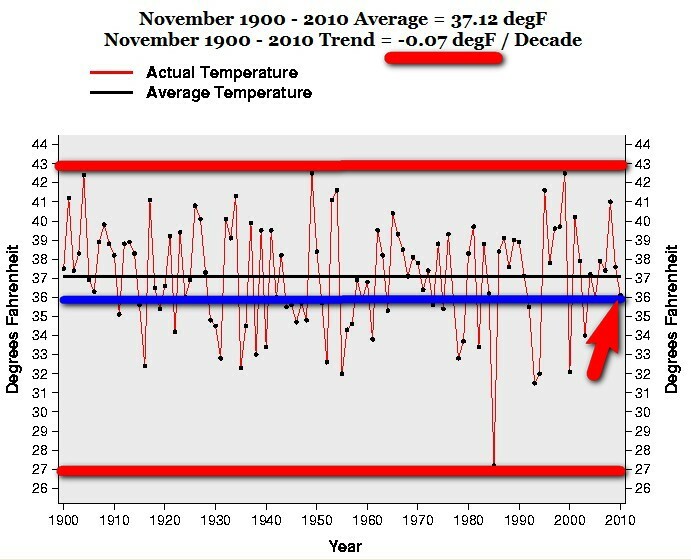 They just “happened” to LOWER the temperature 1880-1900 by OVER 0.3 C and then they just “happened” to RISE the temperature 1990-2007 by OVER 0.2 C. So “suddenly” you have a nice “warming trend” where there were NONE before. 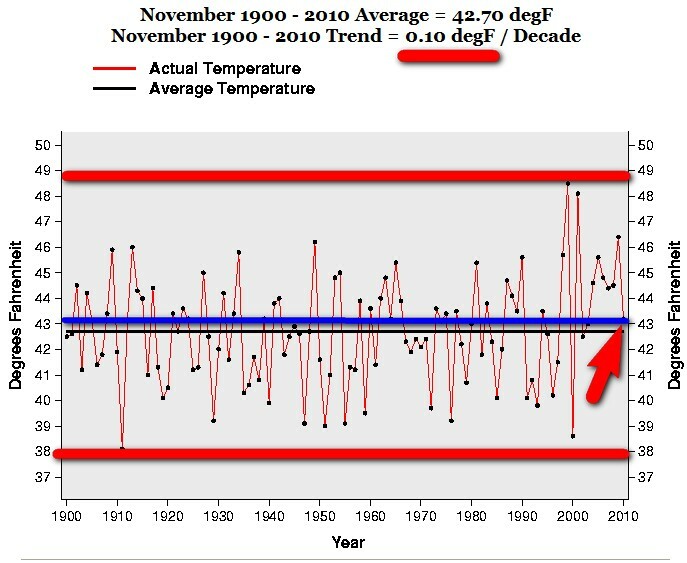 In fact it was a lowering trend from year 2000 which “suddenly” change to a warming trend with OVER 0.4 C difference. NASA and NOAA, which each receive close to half a billion dollars a year in taxpayer funding, have been systematically fiddling the worldwide temperature record for years, making “global warming” look worse than it is, according to a new paper by the Science and Public Policy Institute. The findings are reported by Joe D’Aleo, a leading meteorologist. Robert Ferguson, President of SPPI, said: “Despite billions spent on official claims about the supposed threat of catastrophic man-made ‘global warming’, opinion polls show the public are no longer fooled. A main reason why the voters buy don’t climate alarmism any more is that the tiny but well-connected, lavishly-funded Climategate clique keeps on being caught out bending the scientific evidence. • The global temperature data from surface stations is “seriously compromised: the data suffer significant contamination by urbanization and other local factors such as changes in land cover and land use”. Numerous peer review papers suggest contamination of 30%, 50% or more. 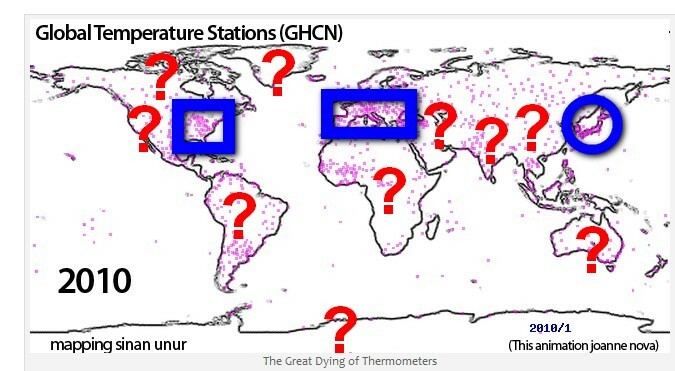 •The state of the temperature database, in the words of one of its operators, is “hopeless”, with “hundreds if not thousands of pairs of dummy and duplicate stations”. •The NASA warming is achieved in part by inventing data in arctic areas where no stations exist. •In the US, the warmest decade of the 20th century was the 1930s, and the warmest year was 1934, NASA’s chief climate scientist announced after the last super El Nino. 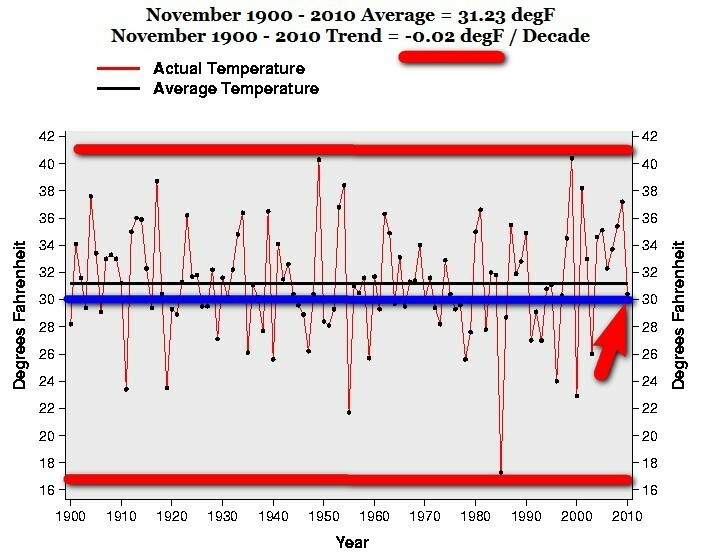 •NOAA tampered with temperature data in 2000, 2007 and 2009 to create an artificial increase of 0.3 F° in the warming trend since the 1930s. 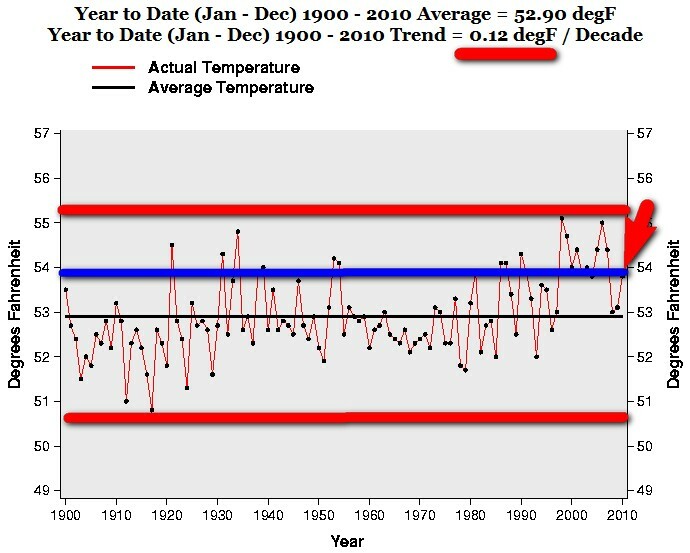 •NASA admits even today on their website, there is no generally-accepted standard for surface air temperatures. •Temperatures for the 1930s to 1950s have been readjusted downward to make the warming since then seem greater than it is. •Temperatures for recent decades have been readjusted upward to make the warming of the 20th century seem greater than it is. 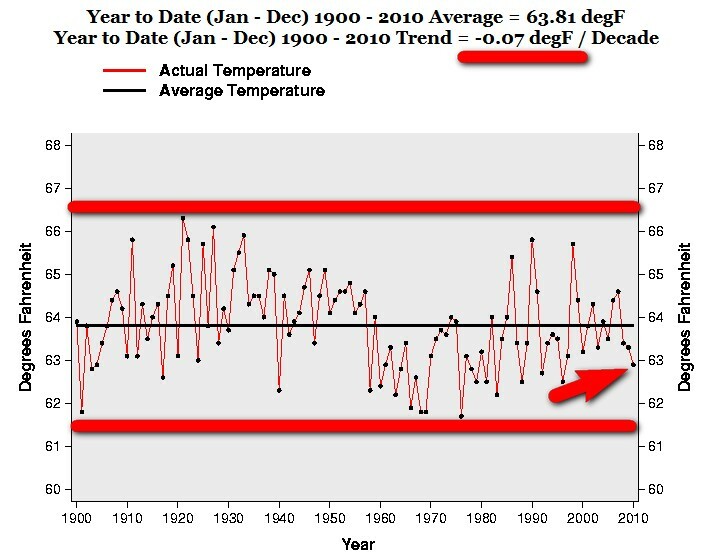 •Over time in the NASA database, the warming trend has been steadily increasing – not because the weather is getting warmer but because NASA keeps tampering with the data. •The data tampering became more serious and more frequent in 2007, when a strong la Niña caused widespread and profound global cooling. 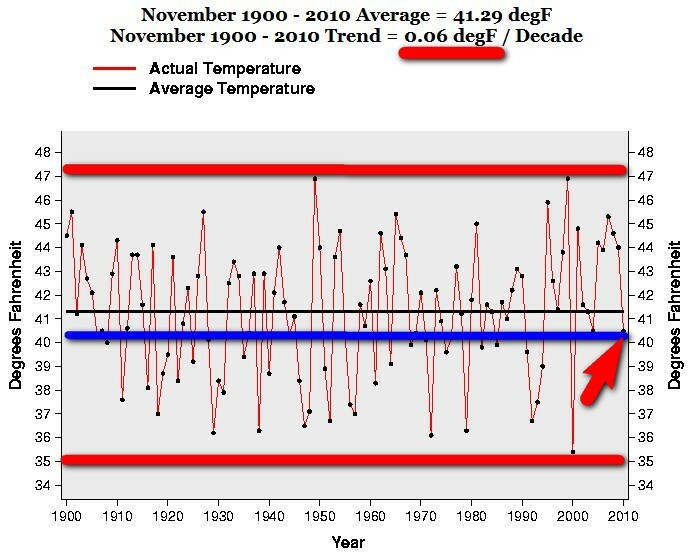 •Adjustments by NOAA and NASA, rather than real-world temperature changes, account for virtually all the apparent warming trend in the global data. •Global temperature databases are “seriously flawed” and “can no longer be trusted to assess climate trends or rankings or validate model forecasts”. 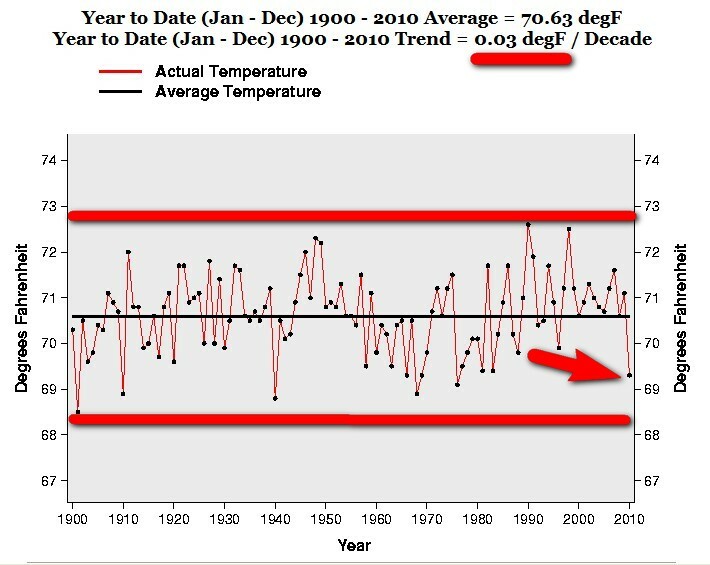 In a lengthy paper updated in August 2010, Surface Temperature Records: Policy Driven Deception? 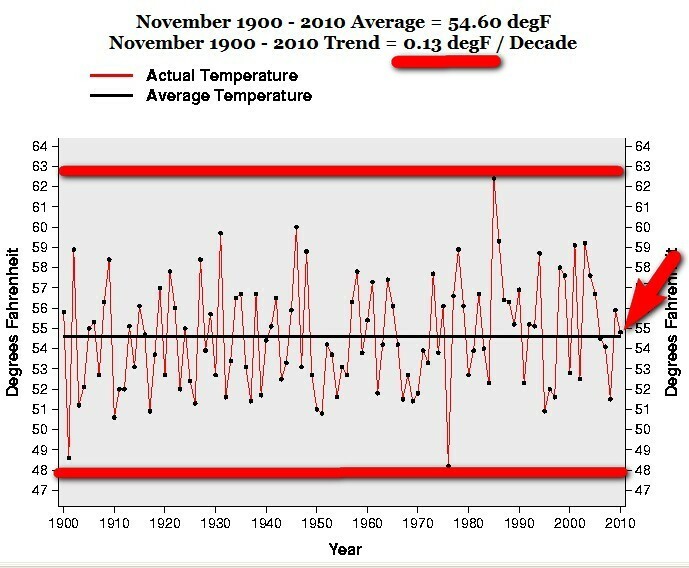 , Watts and D’Aleo catalogued numerous case studies of temperature data tampering around the world. This issue is of critical importance because these very data sets are used as justification of advocacy for formulating and implementing unprecedented policy decisions seeking radical transformations of our society and institutions. 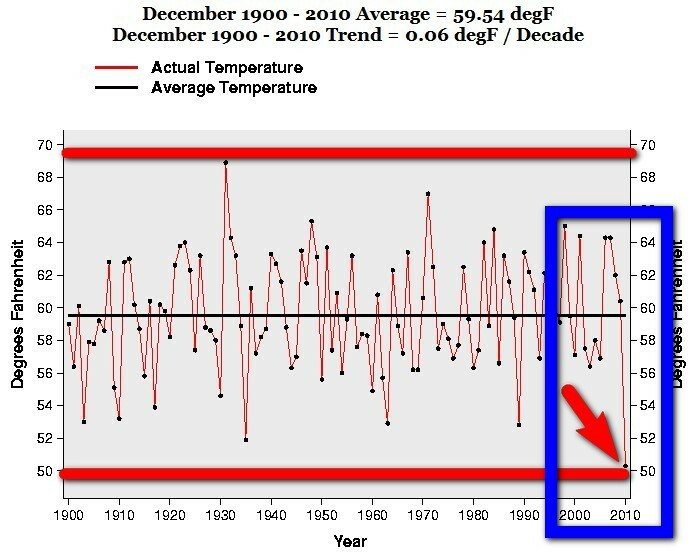 SURFACE TEMPERATURE RECORDS: POLICY-DRIVEN DECEPTION? 10. Satellite temperature monitoring has provided an alternative to terrestrial stations in compiling the global lower-troposphere temperature record. Their findings are increasingly diverging from the station-based constructions in a manner consistent with evidence of a warm bias in the surface temperature record. 11. Additional adjustments are made to the data which result in an increasing apparent trend. In many cases, adjustments do this by cooling off the early record. 12. Changes have been made to alter the historical record to mask cyclical changes that could be readily explained by natural factors like multi-decadal ocean and solar changes. 13. Due to recently increasing frequency of eschewing rural stations and favoring urban airports as the primary temperature data sources, global terrestrial temperature data bases are thus seriously flawed and can no longer be representative of both urban and rural environments. The resulting data is therefore problematic when used to assess climate trends or VALIDATE model forecasts. 15. Reliance on the global data by both the UNIPCC and the US GCRP/CCSP should trigger a review of these documents assessing the base uncertainty of forecasts and policy language. Temperature dropped nearly 10F below average during December. Did you see any headlines like this from the “Mainstream media” who otherwise are so eager to spread the Global Warming Hysteria? NO – And this exactly the point. Because, despite this drastic lowering of temperature, life goes on as normal in Florida and Georgia. And since this was a drastic lowering of the temperature, and does not fit their agenda, no big headlines except in some of the local media. Isn’t it interesting that a PREDICTED (by their beloved computer models) rise of temperature of 1.5-2F in the next 100 years is considered a catastrophe for humankind and an eminent treat for our survival?. By the way, these computer models are the same models THAT CAN NOT PREDICT THE WEATHER A WEEK FROM NOW, OR THE WEATHER A WEEK AGO. But they claim that they can predict the temperature a 100 years from now with 0.1F certainty! And these guys spends billions and TRILLIONS of $ of our tax money to “fight” this predicted “Global Warming” and to “reduce” our “carbon footprint”. Ramming through their political agenda at all costs. So lets look what happened in Florida and Georgia in December. This December is – 9.3F degrees cooler than the average for 1900-2010. And is the coolest December in 116 years. And somehow a DROP of -9.3F degrees in one month compared to the average is not considered a “big deal”. In fact it is ignored. But a “predicted rise of 1.5-2F over a 100 years is considered by the same Global Warming Hysterics to be a total catastrophe for humankind. So to recapitulate: a DROP of average temperature of – 0.3F PER DAY is nothing, ignore it. But a “predicted” rise of average temperature of 0.02F PER YEARis a total catastrophe for humankind. By the way, if you wondered, 0.02F per year is 0.00005F per day. This year is – 1.33F degrees cooler than the average for 1900-2010. And is the 5th coolest year in 116 years. 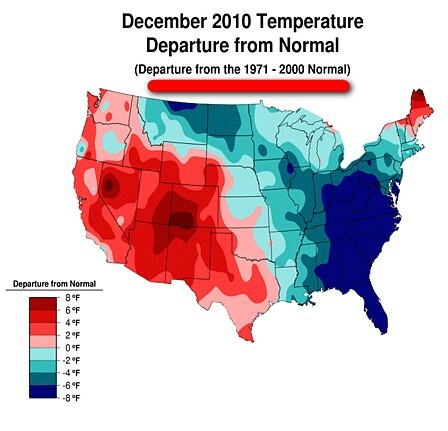 This December is – 8.34F degrees cooler than the average for 1900-2010. And is the coolest December in 116 years. And somehow a DROP of -8.34F degrees in one month compared to the average is not considered a “big deal”. In fact it is ignored. But a “predicted rise of 1.5-2F over a 100 years is considered a total catastrophe for humankind. So to recapitulate: a DROP of average temperature of – 0.27F PER DAY is nothing, ignore it. But a “predicted” rise of average temperature of 0.02F PER YEAR is a total catastrophe for humankind. 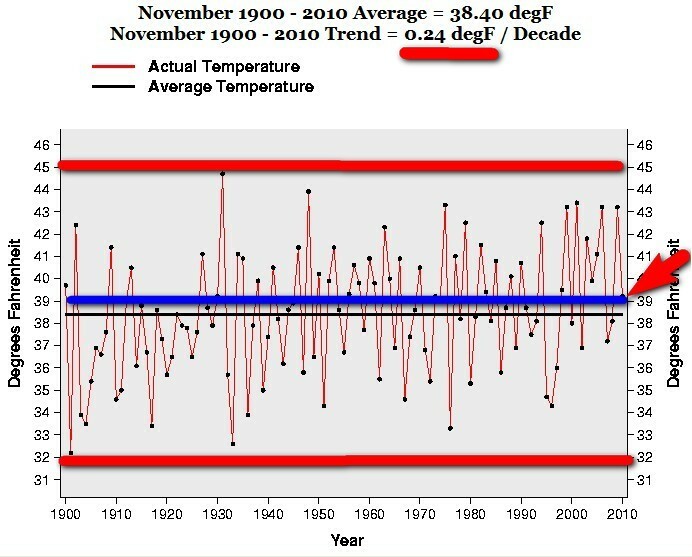 This year is – 0.91F degrees cooler than the average for 1900-2010. And is the 22nd coolest year in 116 years. 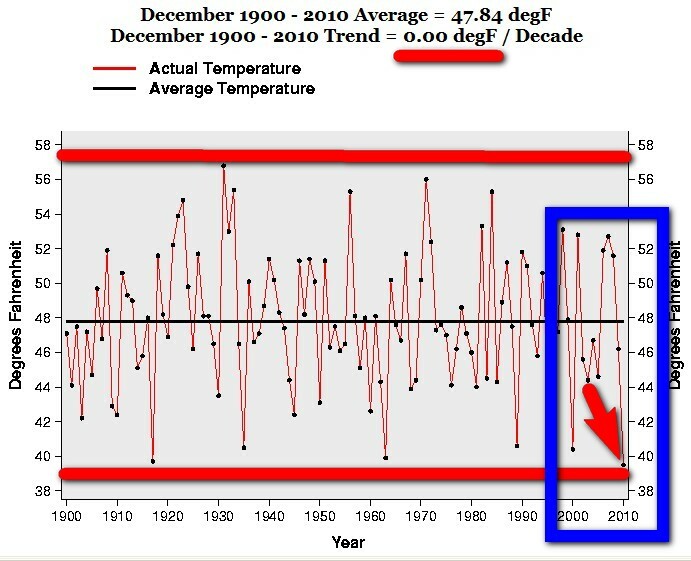 Since the official December temperature figures are out we now have the figures for the whole of 2010. I will in later posts look at the continental US figures and compare them with a state/regional analysis. Not to mention the great slaughter of GHCN stations 1990-1993 – roughly 63 % of all stations were “dropped”. Oddly enough many of them in cold places – Hmmm? 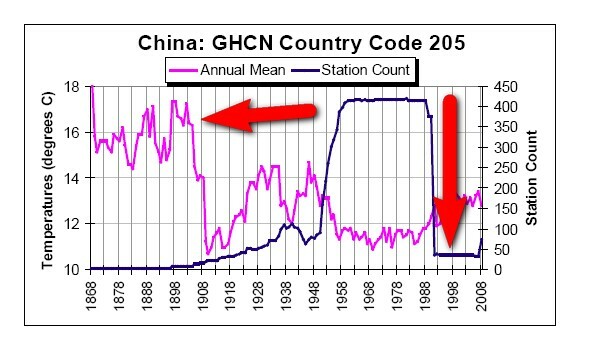 Now the number of GHCN stations are back at the same numbers as in 1890. 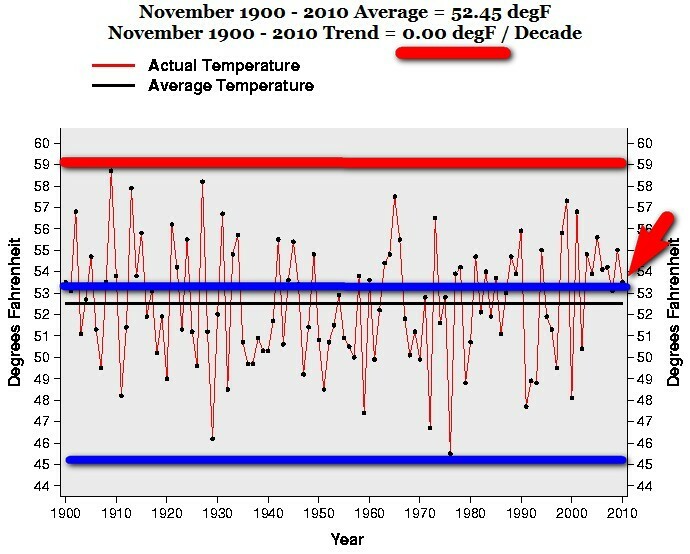 This Year is 0.86F degrees warmer than the average for 1900-2010. The official December temperature figures are out. 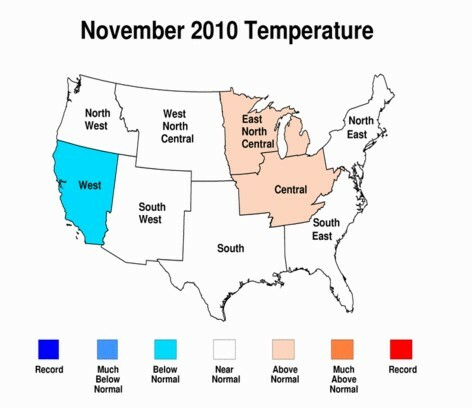 I will in later posts look at the continental US figures for December, and compare them with a state/regional analysis. Also remember that the US stations are now nearly a third of all the GHCN world stations. This December is -0.45F degrees cooler than the average for 1900-2010. While we all are “eagerly” awaiting the official December temperature figures I thought it would be interesting to look at the continental US figures for November, and compare them with a regional analysis. 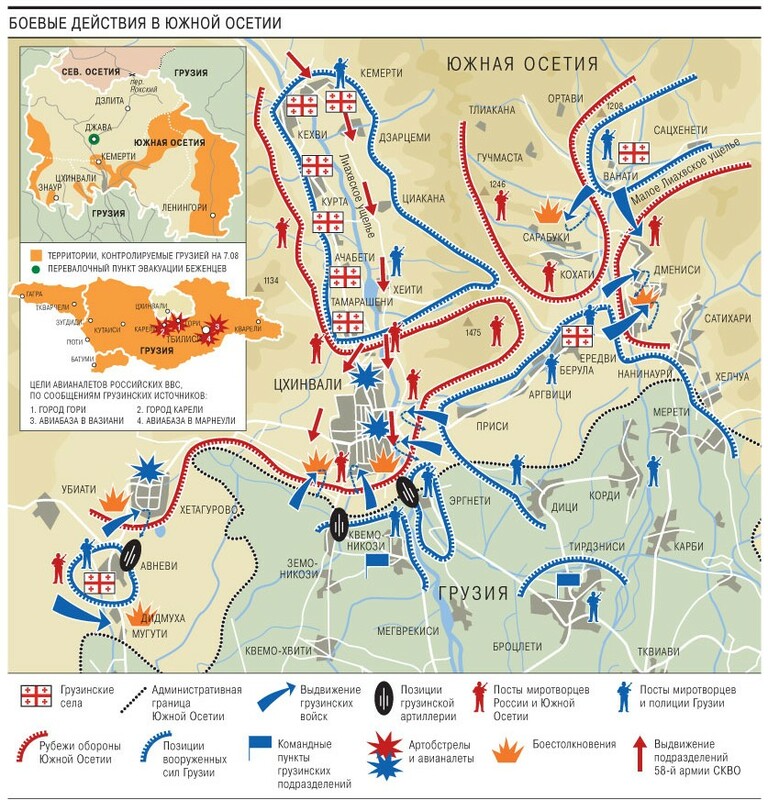 And remember, these are the official figures. With the poor placement of stations (91 % of the stations are CRN 3 to 5 = bad to very poor); where they have purposely taken away the urban heat island effect, use huge smoothing radius etc. This year, the November temperature is – 5.34 F cooler than1999, the warmest November And if we compare this year’s November with 1949 it is – 2.99 F cooler. If we compare with1909 this year’s November is – 2.65 F cooler. That’s what I call WARMING and an eminent treat to humankind! I thought it would be interesting to look at the regional picture. 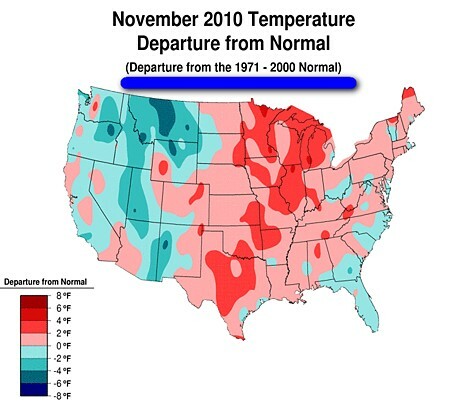 Especially if you see the bright red areas in the official “Departure from normal” November picture above. Which covers the WHOLE central, and most of the eastern USA, from north to south. It looks very dramatic doesn’t it? If you contrast that with the regional one, remember this is from the same people and the same “official data”; the difference is HUGE to say the least. Compare this departure from normal with the regional ones for East North Central, Central and South and you get a very different picture to say the least! Ehhh? Where did these huge red areas of Texas and the rest of the south go??? And East North Central? A “warming trend” of 0,009F degrees a year. 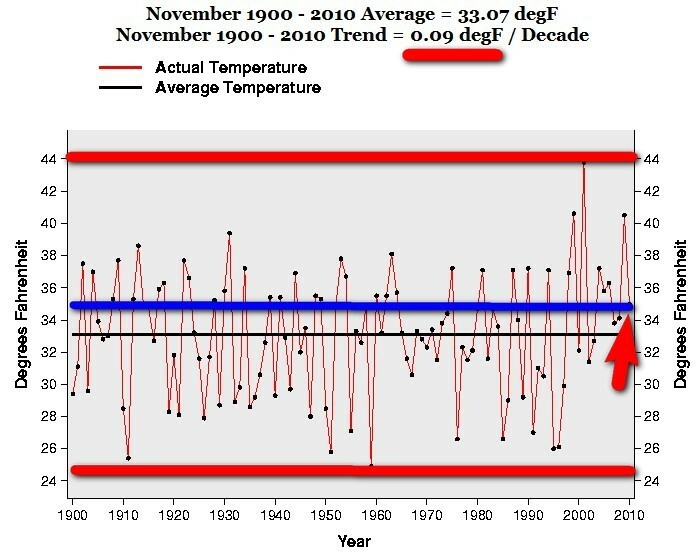 With this dangerous, accelerated and rapid warming it will take 111 years and 2 months to “warm“a whole 1F degree. We are REALLY FACING EXTINCTION ARE WE NOT? And South with a “warming trend” of exactly 0,000F degrees a year?? Whoa – Take cover! Armageddon is here.